Splashbacks, they have become so much more than a practicality. Whilst protecting walls from hob and sink splashes – these days, the kitchen splashback has become a statement design feature. Splashbacks now have the same impact as worktops when walking in to a kitchen, making them a key decision in a design project, so make them count. We’ve chosen our top three designs, guaranteed to create an impact. Achieve the look of hand crafted butcherblock without the risk of mould growth and rotting in damp areas. This laminate finish splashback from our GetaLit range has an eclectic mix of light oak through to mahogany shades, ideal for the contemporary kitchen. Full kitchen range available. This marquina marble replication brings a height of sophistication in to your kitchen with its fine grain design and delicate white vein features. 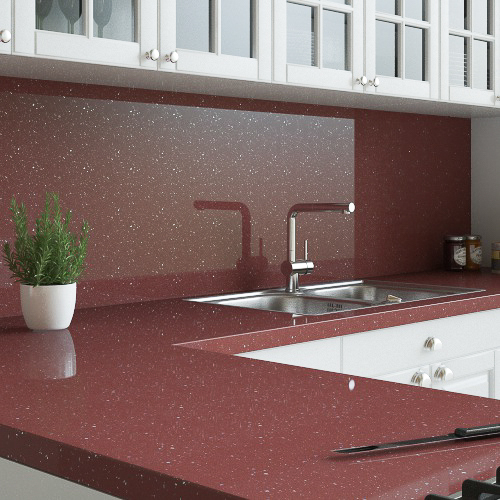 For the risk takers among you, our rouge sparkle splashback guarantees impact in your kitchen by adding warmth and passion. So, whether it be stone, wood or colour, ensure its bold for 2019! To browse our full range of splashbacks, please click here.